In this window you can change the settings of ShellDispenser. The settings on the tabs "Messages" and "Questions" can also be set from within ShellDispenser. Each message that can be disabled/overriden also has a checkbox on the message window; enabling the checkbox will not show that message again in the future. You can re-enable these messages (or change the default action to take) from these tabs. All hot key options. To clear a hot key, press the "Delete" or "Backspace" key. 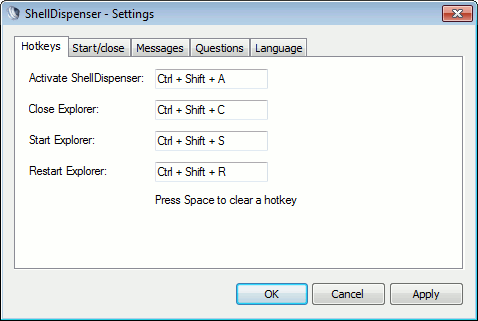 Note that some key combinations are already in use by ShellDispenser itself or other applications. Key combination "Alt + V"
The hot key to activate ShellDispenser with. Press the desired key combination. The hot key to close Explorer with. Press the desired key combination. The hot key to start Explorer with. Press the desired key combination. The hot key to restart Explorer with. Press the desired key combination. All starting and closing options. Whether ShellDispenser will minimize to (hide in) the notification area when you press the 'minimize' window button. Check box "Close to notification area"
Whether ShellDispenser will minimize to (hide in) the notification area when you press the 'close' window button. 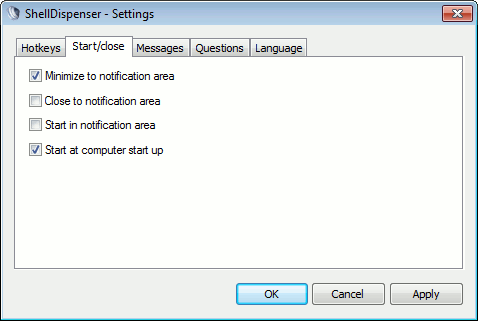 Check box "Start in notification area"
Whether ShellDispenser will start minimized to (hidden in) the notification area. Check box "Start at computer startup"
Whether ShellDispenser will start automatically when you start your computer. All user-overrideable messages ShellDispenser can show. Check box "Explorer successfully closed"
Whether ShellDispenser will show a message when it successfully closed Explorer. Check box "Explorer successfully started"
Whether ShellDispenser will show a message when it successfully started Explorer. Check box "Explorer successfully restarted"
Whether ShellDispenser will show a message when it successfully restarted Explorer. Check box "Explorer already closed when closing Explorer"
Whether ShellDispenser will show a message when the user tries to close Explorer when Explorer is already closed. Check box "Explorer already started when starting Explorer"
Whether ShellDispenser will show a message when the user tries to start Explorer when Explorer is already started. All user-overrideable questions ShellDispenser can ask. When you decide not to show these messages, you have to specify what action to perform by default. Check box "Hiding ShellDispenser to notification area when Explorer is closed"
Whether ShellDispenser will ask for confirmation when you try to hide ShellDispenser in the notification area when Explorer is closed. Check box "Closing ShellDispenser when Explorer is closed"
Whether ShellDispenser will ask for confirmation when you try to close ShellDispenser when Explorer is closed. Check box "Restore ShellDispenser from notification area when closing Explorer"
Whether ShellDispenser will ask for confirmation about whether to restore ShellDispenser from the notification area first when you try to close Explorer. Check box "Retry closing gracefully when Explorer is not responding"
Whether ShellDispenser will ask for confirmation to retry to gracefully close the Explorer process when Explorer is not responding to closing requests. Check box "Retry closing gracefully when Explorer says it's busy"
Whether ShellDispenser will ask for confirmation to retry to gracefully close the Explorer process when Explorer doesn't want to close. Do note that a possible reason Explorer doesn't want to close could be that Explorer is busy with something and thus is asking you first whether Explorer may close. Check box "Retry closing gracefully when Explorer cannot be reached"
Whether ShellDispenser will ask for confirmation to retry to gracefully close the Explorer process if an error occured when communicating with Explorer. Check box "Retry closing forcefully when an error occured closing Explorer"
Whether ShellDispenser will ask for confirmation to retry to forcefully close the Explorer process if an error occured when closing Explorer. The language to use by ShellDispenser. You have to restart ShellDispenser for a new language to take effect. Apply the changes you have made to the settings without exiting the window.